Competing Claims | Ketuvim: the Writings of James R. Getz Jr.
And “University City” is a section of West Philly. Well, the “Penn Bubble” has gotten a lot larger than what used to be called “University City.” Penn’s security now stretches at least to 42nd, and I’m pretty sure their shuttles run all the way out to 50th. There really is a sense that “University City” now encompasses West Philly. I didn’t put up the sticker, but I’m proud to say I have some Lenape blood in me (but to see the real seal of the tribe, go here. There seems to be several competing real seals running around for the Lenape, which makes sense considering how large a territory they used to dominate. 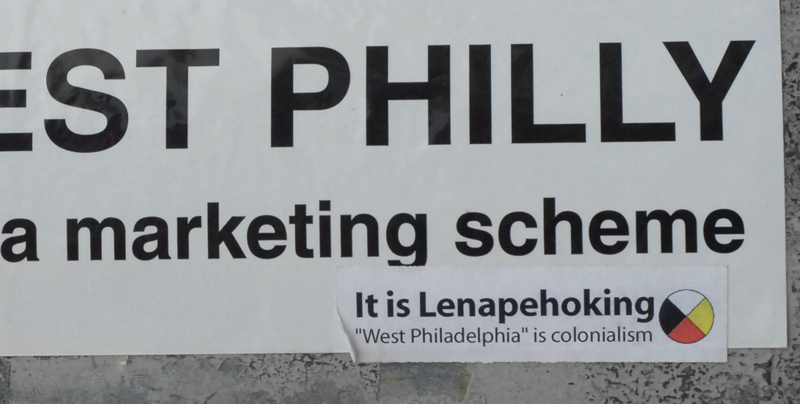 I can’t help but think that renaming West Philly “Lenapehoking” would solve the whole confusion in Northwest Philly (where I live). The name “West Philly” dates back to before the Act of Consolidation in 1854 which brought Germantown, Mt. Airy, Chestnut Hill and a host of other outlying boroughs into the city (including West Philly itself!). Germantown, Mt. Airy and Chestnut hill are further north than “North Philly” and further west than “West Philly.” Very confusing to those from out of town. Maybe Lenapehoking would be a better choice. Actually, “Lenapehoking” is a lot bigger than West Philadelphia. It’s an apparent neologism in the Lenape language referring to the Lenape homeland (roughly speaking, the New York, Atlantic City, and Philadelphia metropolitan areas plus the Poconos and Catskills). I like the term because it’s also where I live and have grown up (I was born in Manhattan and grew up (and currently live) in central New Jersey), so I think of myself as a Lenapehokingian or Lenapehokinger. It seems more natural to me to think of the area as a whole – a “greater New Jersey”, than to split up the land according to rivers, which divides metropolitan areas and generally continuous human settlements.